This is a copy of a symposium published in Amici, the Newsletter of the ASA Sociology of Law Section, 12(2), Summer 2005. Also available in pdf format. with a response by Mathieu Deflem. Please cite as contributions in "Symposium: Book (Author) Meets Dissertation (Authors): Policing World Society by Mathieu Deflem." Amici, the Newsletter of the ASA Sociology of Law Section, 12(2), Summer 2005. This symposium provides a discussion on Mathieu Deflem’s Policing World Society: Historical Foundations of International Police Cooperation (Oxford University Press, 2002; paperback: 2004). The author is exposed to the learned feedback from students who are at various stages of completion towards their dissertation. Penney Alldredge and Kimberly Lyons are busy writing their dissertations, while Sarah Takahama is currently finishing her senior undergraduate year, and Erik Larson has in the meantime completed the Ph.D. requirements and entered the professorial rank. It is only appropriate that students serve as critics of Deflem’s book, because it is a reworking of his dissertation. This panel was previously featured as a roundtable discussion at the ASA meeting in San Francisco, August 2004. The participants are grateful to Brian Gran for organizing the panels and to James Mahoney for acting as moderator. Scroll down for reviews by Erik Larson, Penney Aldredge, Sarah Takahama, Kimberly A. Lyons, response by Mathieu Deflem. In Policing World Society, Mathieu Deflem’s main theoretical points –international police cooperation results from the rise of a Weberian police bureaucracy characterized by autonomy and the rise of an international police culture– are well-supported and well-argued. There are, however, four areas of critical comments I offer about the arguments in PWS. I. The comparison of the United States to Europe in PWS suggests additional conditions necessary to establishing international police cooperation. Given the lack of a national policing institution in the U.S. in the 19th century, the limited involvement in international cooperation is not surprising, as the existence of a national police institution is precedent to this institution gaining sufficient bureaucratic independence to engage in cooperation. Deflem argues that the distance and isolation of the United States contributed to its lack of international cooperation. Another precedent condition becomes apparent: to achieve international police cooperation, a sufficient number of potential cooperative partners must exist and one must be recognized as a potential partner. Less convincing is Deflem’s argument that the issues that the United States faced in relation to the internationalization of crime were insufficient to develop a professional mythology to support internationalization and that these issues were distinct from those faced in Europe. Yet, the examples listed of issues in the U.S. and Europe do not seem so distinct. These criticisms of the foundations of the comparative analysis, though, do little to undermine the Deflem’s theoretical argument, largely because the best comparative-historical analysis concerns not the differences between the U.S. and Germany, but the differences between the international meetings and the development of cooperation over the time period. The criticisms, however, suggest precedent conditions to Deflem’s theoretical model. II. Deflem’s focus on bureaucratic autonomy might obscure the impact of democratization on police cooperation. Police institutions in Europe began to develop bureaucratic autonomy in the aftermath of the events of 1848. Deflem traces the shift in international policing as a change in orientation from politics to crime, locating this change in “international police culture.” Left unexplained is why international police culture should focus on crime, particularly given the institutional histories of the national police in protecting national governmental regimes. There is an affinity between the goals of democracy and the change in policing, with crime prevention focusing on protection of citizens and the nation, rather than protection of the ruler. Also, a focus on democratization is not inconsistent with Weber’s theory on bureaucratic development. III. There are a number of potential gaps in Deflem’s theoretical and substantive discussions of international police cooperation. First, international police cooperation implies a certain form of internationalization, limiting the application of the findings to other processes of globalization. By definition, international police cooperation would seem to exclude analysis of hierarchical impositions of policing requirements, limiting the types of international processes that the theoretical model developed in the book can explain. Second, the focus on police culture gives this culture undue independence at the global level. The theoretical argument and empirical evidence focus on police and their particular nation states. There may be other global structures that have historically worked to limit or channel the development of international policing (e.g., human rights accords). It seems reasonable to begin from the position that if there is an international or global police culture that there may be other global structures and forces that impact the police culture. Third, although treated as a variable, the concept of bureaucratic autonomy is not sufficiently operationalized. Deflem connects variation in the participation of five communist-bloc countries in the International Criminal Police Commission (ICPC) to bureaucratic autonomy, arguing that after 1952 these police forces could “no longer maintain formal bureaucratic autonomy” (208). There are, however, no measurements of the level of bureaucratic autonomy that show the difference in these countries from 1945 to 1952. Further, Deflem earlier suggests that the lack of Soviet participation in ICPC could be partially explained by the USSR’s influence on satellite countries, suggesting that there may not have been much bureaucratic autonomy in those participating bloc states. Fourth, PWS offers conclusions about globalization that go beyond the evidence in the book. For instance, in discussing the implications of the argument about the differential impacts of globalization, Deflem writes that national policing systems have not trended to uniformity. There is, however, limited evidence about national cultures and police system traits. The evidence that there is focuses largely on the U.S. and Germany, but given the lack of participation of the U.S. in international police cooperation, one could hardly expect that U.S. policing would be equally influenced by world policing culture. IV. PWS presents the development of international police cooperation as related to one social process: the development of Weberian-bureaucratic policing. Once developed, however, other social processes may shape the trajectories of further developments in international policing. Evidence from Deflem’s book concerning the re-establishment of the ICPC after World War Two shows a greater level of direct government involvement in international policing than in earlier eras. After the war, European governments may have had an interest in having a rejuvenated ICPC to signal a return to normalcy and professional, apolitical policing. In sum, Policing World Society offers a fascinating argument. My critique owes much to the careful work of Deflem in constructing an elegant theoretical model and collecting an impressive array of empirical data. Deflem’s theory and data provide sociologists good ground to extend and apply the ideas from the book. Mathieu Deflem’s Policing World Society uses a Weberian theory of bureaucratization, influenced by studies of globalization, to explain the development of international police cooperation and present a theoretical model of the history of international policing. Deflem’s study specifically focuses on German and US international policing from mid-19th century to the end of World War II. Deflem develops three specific propositions. First, a structural argument: as police institutions become more institutionally independent from their political centers, they are increasingly able to cooperate at the international level. Second, an action-oriented argument: as police institutions increasingly share an interest in fighting international crime, those institutions are increasingly likely to cooperate with an international policing organization. Third, an argument regarding the international context of policing: national interests remain of primary importance when considering the planning and execution of international police activity. The first two propositions are arrived at through a neo-Weberian perspective that views increasing police bureaucratization and professionalization as complementary processes. This reasoning explains why early 19th century police activities were limited in their scope, and policing limited due to issues of national sovereignty. Deflem claims that ideological differences cannot be held accountable for the exclusion of certain police in international organizations. This point is well taken, but there is still a question of whether ideological differences may have simply been more of a deterrent to international cooperation for some countries than for others. Mention of the relative success of other international cooperative efforts, such as in science and medicine, would help to demonstrate whether lack of participation in ICPC has more to do with the bureaucratic autonomy of the police specifically or the political climate generally. The second proposition demonstrates how structural conditions were not sufficient to ensure successful cooperative international policing. But what would have added to his explanation is discussion of specific instances of international policing and criminal activity, and whether the targets of ICPC did in fact represent examples of this myth. Without specific discussion of who was being targeted, it is difficult to tell the extent to which this professional myth was in operation. Additionally, further discussion of how “myth” is operationally being defined in this instance is in order, such as in Mythologies by Roland Barthes. Deflem’s third proposition draws from the perspective of globalization. Deflem operationally defines globalization as “designating a degree of interdependence between geographically distinct social units, especially national states and their institutions” (5). International policing consists of collaborative networks between independent, national systems of policing, and that international police activities typically do not conflict with national tasks. Nationality continues to be of importance, as participation in international police organizations were aimed to advance national interests. This is perhaps most evident in the discussion of the breakdown of international policing – the Nazification of the ICPC and the US ambivalence and withdrawal from the organization. Deflem’s study encompasses the period from the mid-19th century to the end of World War II. While this study is not meant to focus on and explain current developments in international policing, Deflem does briefly address the events of September 11 in his concluding chapter in terms of his overall model. He argues that while post-September 11, like during World War I and World War II, represents a functional and organizational expansion of police duties to include political interests (namely, terrorism), international policing has not entirely become politicized and narrowly tied to state political interests. Deflem claims that “International terrorism provides a global battlefield on which many of the nations of the world are at war” (229). This statement, however, neglects to take into account how terrorism has historically been treated as a problem specifically of policing rather than an instance of war. Expansion of the time period to be analyzed in this book to include the years leading up to September 11 and greater detailed analysis of the event itself would have added considerably to the analysis. As it is, the treatment of September 11 is overly short and seems like a forced afterthought. Perhaps a New Institutionalist perspective could help to explain the persistence of the independent culture of international policing in light of very significant challenges. In The Role of Institutionalism in Cultural Persistence (1991), Lynne Zucker finds that with increased institutionalization, cultural understandings are also increasingly uniform, allowing greater resistance to change. Additionally, Steven Brint and Jerome Karabel’s study on institutional origins and transformations is interesting to consider because their analysis considers both structural constraint and also gives an autonomous role to actors that is not as present in Deflem’s more structure and organizationally-oriented argument. Considering the roles of elites in the development of the field of international policing would add an additional layer of depth and micro-level understanding to this study that would seem to increase its explanatory power. Overall, however, the level of nuanced detail in this study is extraordinary. It provides a welcome and needed addition to the field. I don’t really know where to begin except to convey my respect and interest in Professor Deflem’s research and thesis of the internationalization of policing. Having in a recent fieldwork paper applied Max Weber’s ideal-type bureaucracy to San Francisco District Attorney’s Office, I was delighted to read material that was so well aligned with my recent endeavors. However, the beauty of the book is not that an individual with extensive sociological training can comprehend its message, but rather that a person with absolutely no training whatsoever can still understand and grasp the book’s significance. In stating this, I by no means think Deflem’s book is simplistic. On the contrary, it is dense in nature, but not wrought with an over extended vocabulary and “name-dropping” as are many academia books. The material is mapped out concisely and cohesively. To me, there is nothing more impressive in academia than to challenge traditional theories and concepts—and this is exactly what Deflem did. What my fieldwork at the District Attorney’s revealed about bureaucracy is what Deflem discovered about policing—rationalization and professionalism do not always inhibit society. On the contrary, bureaucracy is often needed to execute specific functions at a faster rate in addition to seeking autonomy from state-centered institutions. Therefore, I thought it was absolutely genius to use the Weberian model of bureaucracy in application to understanding the internationalization of policing. Utilizing this model forced the reader to reconceptualize his/her preconceived notions of bureaucracy and its supposed “inhibitive” nature. As Deflem discussed, in order to dismantle national and cultural boundaries, bureaucratization of policing was the essential tool that many researchers have overlooked. By enhancing professionalism, international police began to grasp independence by means of shifting power relations from the political leader to the professional expert. It was in the idea of the “machine-like” police that I found most fascinating aspect of Deflem’s theory. While many criticize bureaucracy for eliminating the personal relationships between individuals, I argue that bureaucracy satisfies the need for efficiency and overall human interest in contemporary society. For example, there are two main styles of policing: the micro-subjective “watchman” and the macro-objective “legalistic” approach. In Deflem’s study, police who hold to political ideology are the watchmen and the professional experts are the legalists. I would suggest that the police ought to take a legalist approach to crime because it eliminates bias as professionalism debilitates state control over policing interests. On a larger scale, I compared the United Nations to the internationalization of policing. In lieu of globalization, particularly with the spread of technology, individual nations can no longer ignore the threat of exterior forces. Accompanying the fear of external attack (via terrorism, war, etc. ), there ought to be instated laws that are upheld by all nations. Given, laws are difficult if not impossible to make universal. However, certain ideals such as human rights and international crime must upheld if an overall sense of peace is to exist. When I reviewed the section on the ICPC, and the United States failure to produce a successful international tie, I came across a few thoughts that need clarification. In Professor Santos’ class, I wrote a paper on the U.S. inability to support the International Criminal Court. Being that our sovereignty as a nation would be in jeopardy, I wondered if the same fears would resurface when discussing the internationalization of policing. Deflem mentioned that would not be so. However, if an international criminal of U.S. citizenship was under surveillance by international police, how and by whom would this person be brought to justice? I absolutely agree with the reasons that Deflem mentioned like geographic location as being inhibitive factors in U.S. involvement. However, in the case of the U.S., does political ideology and sovereignty issues overshadow its ability to take part in international affairs such as policing and the ICPC? Another thought that crossed my mind extends beyond the use of bureaucracy to produce international policing. The globalization of technology and free market has produced new international ties. However, being that the U.S.’ market has dominated the economic realm at a global level, I was wondering how U.S. dominance in the globalization phenomenon would affect the internationalization of policing. For example, if the McDonaldization of culture can exist, then is it not possible for the McDonaldization of law to exist as well? Being that the U.S. controls much of globalization’s flow, is it possible for the U.S. to control the overall structure of policing? In other words, how much authority does America have in regards to policing? Again, these are just a few questions that have crossed my mind in the course of reading this book. Also, Deflem’s topic is of much relevance in lieu of 9/11 and international terrorism. This is a very interesting topic and study that has helped me to understand Weber’s bureaucracy, international ties, and the history of policing. Reviewing this book was well worth my time, and I enjoyed discussing this with fellow sociologists... although I am far from writing a dissertation! In Policing World Society, Mathieu Deflem offers an absorbing analysis of international cooperation among national police agencies. This work makes a significant contribution to the burgeoning field of global criminology, tapping into the largely unexplored dimension of organizational developments in international police cooperation. In applying a Weberian perspective to his analysis, Deflem moves beyond the Marxian and state-centered models of social control and policing to explore the dynamics of social organization as a critical factor. Deflem provides impressive empirical support for his argument that police autonomy and bureaucratization are vital to the establishment of international police cooperation. Policing World Society is certainly a thought-provoking book. The central argument of the book is that the development of widespread participation of national police agencies is related to the bureaucratic processes of those agencies once they have become sufficiently emancipated from their political contexts and have developed a specialized agenda for the control of international crime. Deflem’s Weberian perspective breaks clear of the functionalist, Marxian, state-centered, legalistic, and Foucauldian post-modernist approaches that dominate sociological research in this area. Deflem takes particular issue with state-centered and Marxian models of international policing. However, I wonder if the state-centered and Marxian perspectives themselves “fall short in terms of empirical adequacy requirements of constructing theoretical models that can account for variation in reality” (p. 31). I would argue that they do not. While some state-centered scholars argue that international police strategies “are deliberately constructed and executed as a politically motivated contribution to a powerful state’s international security agenda and quest for international dominance” (p.30), this is not, as Deflem implies, an accurate description of the state-centered perspective in general. One may argue, from a state-centered perspective, that the state seeks an efficient route to the pursuit of its goals as a social organization, to sustain and protect itself, to pursue an efficient means towards its goals of success among other nation states, and to variously constrain and permit the activities of its various bureaus that it has charged with the responsibility of assisting in such matters. Is then the bureaucratic model presented here a “contrasting perspective” (p. 15) that breaks clear from the state-centered approach? I would, again, argue not. Indeed, the work presented here is far more synthetical than it is contrasting. By augmenting the state-centered perspective with a focus on bureaucratic factors, Deflem extends the scope of the extant research on this topic, introducing a multi-causal argument. While a bureaucratically mature national police force enjoys a modicum of institutional freedom owing to its professional legitimacy, as Deflem has demonstrated, the national police nonetheless remain agents of the modern state, which maintains its monopoly over the legitimate means of violence. Is it not the case, then, that the only such liberties enjoyed by the police are those that the state permits? Could a highly developed bureaucratic structural autonomy of a national police agency undermine or at the very least circumvent the state’s monopoly over the legitimate means of violence? Or is a bureaucracy of the state so inextricably linked to the state that the political agenda of a bureau is, de facto, the political agenda of the state if the political centre fails to countervail? Deflem’s argument does not affirm any of these scenarios. Rather, Deflem implies that the formal bureaucratic autonomy and associated legitimate authority of a national police agency strengthens its ability to pursue its “apolitical” bureaucratic agenda by not inspiring state resistance. That the state would allow for the formal bureaucratic autonomy of the national police is a necessary (though insufficient) structural precursor to cooperation is, I would argue, a state-centered perspective. The Weberian argument presented here, it thus seems to me, is not a contrasting argument to the state-centered view, but rather one that moves forward from, builds upon, or augments the state-centered perspective, rendering it complex without abandoning its foundation. My defense of the state-centered perspective notwithstanding, a critical examination of the power elite is necessarily borne of cynicism and unfortunately enjoys a wealth of empirical support that, not surprisingly, blinds some researchers to the extra-political forces driving social control and policing. Moreover, with the growing fusion between military affairs and policing, and the outsourcing of social control to private companies, the extent of formal bureaucratic autonomy would seem to be increasingly difficult to identify. This is particularly so when faced with questions of culpability in cases of impropriety akin to those as seen in the atrocities at Abu Ghraib. Is the President of the United States, for example, who simultaneously serves as the political leader of the state and the commander in chief of the military, responsible for the actions of agents serving in a bureaucratically autonomous set of institutions? Is a semblance of formal bureaucratic autonomy a resource for those political agents seeking release from culpability? Does formal bureaucratic autonomy inspire structural conditions conducive to a rational amoral pursuit of the most efficient means to a valued end? The empirical evidence available thus far seems to suggest that all three scenarios, simultaneously, may be true. I am very grateful to the discussants for having commented on my book in such an exciting manner. Their thoughtful reflections have given me the opportunity to revisit my arguments. Erik Larson takes me to task for having presented a theory that is too elegant. In response to Larson’s first critique I respond that whatever formally similar conditions existed between the U.S. and Germany, they played out differently in terms of international police activities. To this day, police systems in European nations are far more centralized and militaristic than is the case in the United States. Larson’s second critique, that I neglected the process of democratization that affected the internationalization of policing, is very well taken. While there must always be a police culture that defines and justifies its playing field, such a culture can only flourish under conditions of democratic (industrial) societies. In my book I take these issues only implicitly into account, such as when I adopt the Weberian argument that police cultures can only flourish in societies that are pacified. Next come two critiques by Larson that have occasionally plagued the reception of my work these past years: I would have insufficiently operationalized my concepts and I would have reached some conclusions that go beyond the evidence. I have some trouble dealing with these critiques, perhaps because instead of asking only questions that can be measured with super methods, my book addresses the questions that have to be asked with super theories. But I could indeed have provided more concrete indicators to back up some of the secondary statements in my work. Yet the task would have been phenomenal, for research on international developments is faced with the problem that in order to provide a comprehensive picture, one would have to work bottom down from international developments to all of its participating institutions. Finally, Larson is not entirely mistaken in arguing that my work was primarily oriented at explaining the establishment of international police cooperation. However, apart from this transformation from politics to crime and from temporary cooperation to a permanent organization, my book addresses many other developments over a 100-year period, including the late 19th-century failed attempts to establish police cooperation by means of intergovernmental agreements; the international dimensions of the police professionalism movement in the United States; the changes affecting international policing during World War I and as a result of the Bolshevik Revolution; the establishment in 1923 of the International Criminal Police Commission, the organization today known as Interpol, and the latter’s Nazification and subsequent reformation after World War II. I do no think I can be faulted for not having written another book, one dealing with the more recent history of international policing since the 1950s. I would also question Larson’s claim that governments have been more involved in recent years in influencing international police work. To this day, Interpol is not an inter-governmental organization but a professional association of police. Penney Alldredge is generally more supportive of the institutionalist orientation she recognizes in my work. However, Alldredge uncovers a missing element in my book that I freely admit to: the book is primarily oriented at the organization of international police structures but has less to say about specific instances of police operations and international criminal activity. Also, in retrospect, I somewhat regret having used the term myth, not because it is incorrect, but because it is often misunderstood, and therefore now prefer to speak of knowledge systems. Alldredge also faults me for having neglected more recent developments of international policing. In Policing World Society I only touch on contemporary issues in the Conclusion where I devote the final section to ‘September 11.’ Alldredge refers to the section as a “forced afterthought” and I could not agree more. The section is an afterthought because that is all it was meant to be, as a provocative instance of how my theoretical model might be transposed to the contemporary scene at least in order to raise relevant questions rather than provide definite answers. The afterthought is forced because it was written not long after the events of 9/11, when in January of 2002 I finished the final version of my manuscript. But I did already argue in my book not only that international terrorism provides an internationally divisive issue, but also that terrorism is criminalized at the level of police institutions. Sarah Takahama is happy, as am I, that she can tie in her work with mine. Takahama unnecessarily apologizes because, as an undergraduate student, she claims to have no relevant training. But I am sure that she will have developed plenty of intellectual insight, as sure as I know many with much more formal education than her who don’t. It is very gratifying for me to read that Takahama praises my work for its clarity and comprehensiveness. I hope she will be selected as a reviewer for my next NSF proposal. Takahama points out that the rationalization of international policing, like the bureaucratization of policing in general, brings about certain gains in terms of rights and justice. In theoretical respects, indeed, my work implies a rejection of the conflict-theoretical appropriation of Weber’s work. But we also have to be careful not to respond to an unnecessarily normative approach with an alternative normative perspective. As sociologists we cannot be moralists. Takahama also addresses the issue of how international developments relate to national and regional concerns. Indeed, sovereignty is a central issue and, as I argue in my book, at the level of policing there is a persistence of national considerations even in international activities. This tendency of national persistence is also revealed in the differential impact that the police institutions of various nations have one the international level scene. As Takahama rightly points out, the metaphor of McDonaldization might be useful here, not only because the perspective is indebted to Weber’s theories, but also because it hints at the dual process of exporting police standards, on the one hand, and consuming them, on the other. Kimberly Lyons offers thoughtful reflections on my book from the viewpoint of the critique my bureaucratization model implies against state-centered perspectives of international policing. Lyons finds that I have construed an intellectual enemy of a state theory that is all too simplistic and too easy to criticize. Lyons’ critique is one to consider seriously. My critique of state-centered theories of international policing indeed implies a specific critique of those theories that view of international policing operations as the political efforts of certain (politically strong) nations to control other (politically weaker) nations. I have to concede that my critique on certain state-centered perspectives of policing and social control at times led me to adopt in the book, at least implicitly, a perspective of the state that in fact I do not adhere to. Lyons is perfectly correct to suggest that we ought to look at the state itself as a (multi-dimensional) rationalized structure. I should in that sense have been more recognizant of the implications of the Weberian definition of the state on which my work relies. I can agree with Lyons that my bureaucratization theory does not imply a critique of all state perspectives, but, instead, that it is congruent with and amplifying of a perspective of the state that does not reduce police activities in the political-ideological terms of government directives. Such a more suitable perspective of the state, in other words, will not focus unduly on the presumed powers and underlying ideological motives of the center of the state alone. My theory is not at odds with an intellectually sound theory of the state, but only with one that refuses to take police (and other) bureaucracies seriously. Perhaps the at times somewhat too strongly articulated claims in my book can be attributed to, if not excused by, my eagerness to make the point that sociologists should take policing seriously and not just assume that police behavior can be accounted for by reference to political and/or economic forces, or, worse yet, need not be addressed by sociologists at all. Therefore, I tend to formulate my theses in the book very sharply, and sometimes a little too much perhaps. I have never been known to be very subtle. I can honestly say that I have learned much from the informed feedback of the discussants in this roundtable and that it was a pleasure to write this response. Hopefully, the issues we have collectively raised not only make sense to us, but also as such. 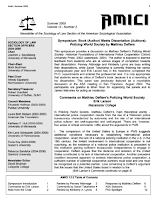 Click here for an online copy of Policing World Society!